Tipard Android Data Recovery enables you to recover android files including deleted text messages, photos, contacts, all logs, message attachments, gallery, photos, videos, audios and more documents. Besides, you can restore or retrieve deleted files for various popular Android devices, such as Samsung Galaxy Note 4/S6/5/4, HTC M8/M7, LG, Sony, Google phone, ZET, Huawei and more Android phone, tablet. Besides, it is compatible with any version of Android OS between 2.1 and 5.1. After updating, this software is highly compatible with windows 10. Tipard Android File Recovery, an incredible tool for recovering deleted contacts, messages, call logs, message attachments, photos, videos, audios and more documents for Android phones/tablets like Samsung, HTC M8/M7, LG, Sony, Google phone, ZET and so on. 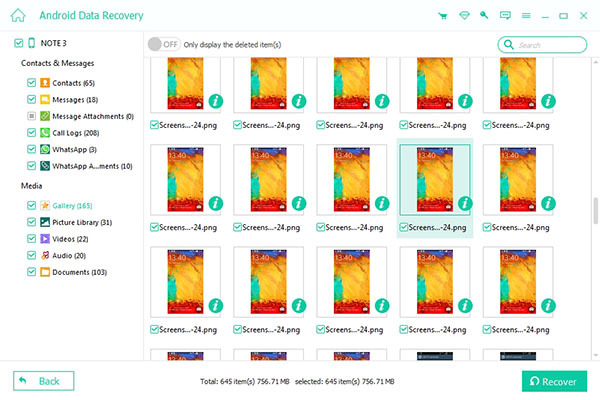 This Android Data Recovery Software can retrieve the data on the internal SD Card. For example, if you have backed up your text messages in your SD Card, but for some reason, these text messages are deleted, Android Data Recovery tool can help you find them back and save on your computer. With this Data Recovery for Android, you can preview all the recoverable data in details before recovering. These data including deleted text messages, contacts, photos, call log and even documents, and you have the right to decide to recover which one in the computer. The considerate software can also help you distinguish the deleted data from the existing ones by different colors. This software is highly compatible with windows 10.